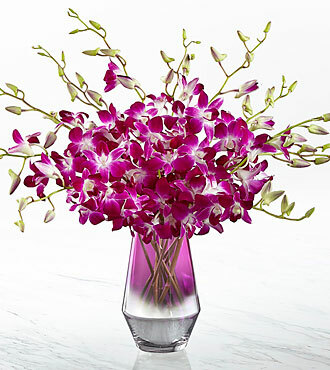 The FTD Pink at Heart Orchid Bouquet grabs everyone's attention with it's sheer abundance of blooms! Hot pink Dendrobium Orchid stems will win your special recipient over, boasting multiple flowers on each stem to create an colorful display meant to make that perfect impression .Presented in a keepsake shining silver and lavender ombre inspired glass vase to add further drama to this fresh flower bouquet, this arrangement is ready to help you express your most heartfelt Mother's Day, thank you, or happy birthday wishes this spring season. STANDARD bouquet is approx. 21H x 21W. DELUXE bouquet is approx. 21H x 23W. Your purchase includes a complimentary personalized gift message.